Random Thoughts by Rebecca: Got Bored? Well I accomplished my one and only goal today. To be bored. Today was President's Day. I was off work. My kids were at school. This was a very timely arrival of awesomeness because on Feb 12th I told my studly husband the only thing I wanted for Valentine's Day was for him to take the kids far away and not to come back until Feb. 17th. You see, I had hit the wall. The wall of client expectations, expense reports, laundry, dog hair, cat box litter, dirty backpacks, basement drywall dust, SpongeBob at Vol level 7, incessant rambling about iTouch apps, incessant rambling about anything, being a cranky wife, not running as much as I should, not caring that I'm not running as much as I should, I could keep going but you get it. First I stayed up til 2am the night before and watched every show I had tivo'd. This ranged from Oprah to the hotness of Rob Lowe and his Brothers and Sisters. Then when morning came I laid in bed while the man of the house shuffled the kids off to the big yellow bus. Then I stumbled to the couch for some Today Show Olympic action. I made a HUGE pile of whole wheat pancakes and covered them in real butter and real maple syrup. I drank tons of spiced coffee. I did vacuum the floor during The Ellen Show commercials and folded one load of laundry just to not feel like a total sloth. Then I ate a huge plate of chicken friend rice with a glass of wine for lunch. And then from the complete exhaustion of awesomeness, I napped. 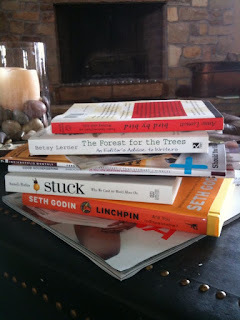 I read from this stack of books and magazines until the kids came home from school. The most exhilarating day of nothingness I've had since about 1989. So, because I'm a big fan of goals, I can successfully check this one off the list for today.